Bring the sugar and 2 cups water to boil in a medium saucepan over medium-high heat. Reduce the heat and allow the mixture to simmer, without stirring, until the sugar dissolves, about 3 minutes. Set aside to cool completely. 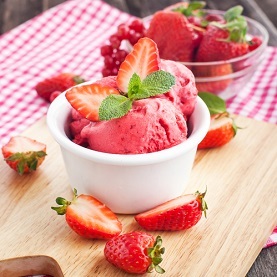 Put the strawberries and lime juice into a food processor and puree. Press the strawberry puree through a strainer to remove the seeds. When the sugar syrup has cooled completely add it to the strawberry puree. Add the corn syrup and stir well. Pour the mixture into an ice cream maker and freeze according to the manufacturer’s instructions. Sorbet is particularly soft after churning but firms up after freezing. Enjoy!